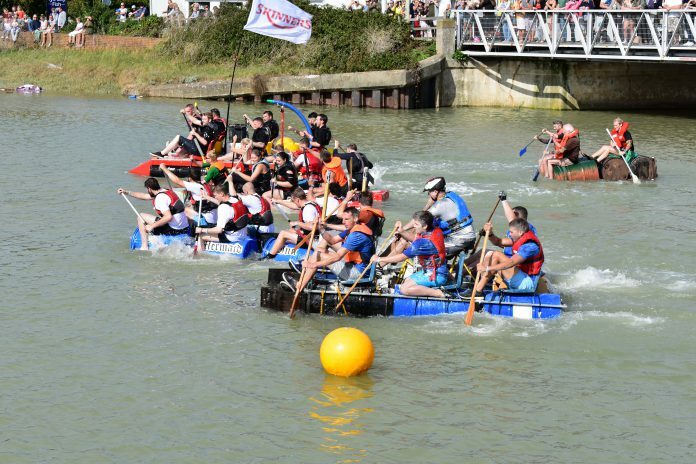 Sunday in Rye was awash with all things nautical with a highly entertaining raft race and festival on the Strand. 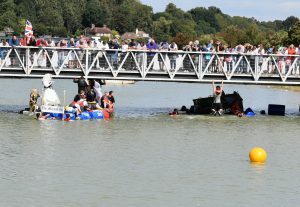 With seven entrants to the raft race this year, there was a highly charged competitive spirit between the front runners on their home-made contraptions. In first place again was Skinners of Rye, with the Mermaid Inn second and A Rye Good Time third. Following them home were Jenco Electrical and the Rye Retreat. Unfortunately, the wind got the better of Flobea and in particular the Crown who were pushed back under Monkbretton bridge at one stage, however, their elaborate raft decked up as a beer table complete with optics and parasols did win most fun raft for the second year running. The Mayor, Councillor Michael Boyd and the town crier led the procession along with the Ryebellion Drummers from the race finish, along the High Street to the Strand, where rafters were presented with prizes and certificates. The quayside looked stunning with bunting and flags, put up with the kind help of clients of Rock Channel Marine. The riverside was packed with stalls offering beautiful local gifts and produce along with a number of charities raising funds. There were a fewer boats this year as the exceptional high tide and warm weather meant many were out racing! But music flowed all day from the Rockitmen and guests and visitors were well fed and watered by local food suppliers. The sea-themed fancy dress, sponsored by Rye’s Own, preceded Captain Pugwash Readings by the fabulous town crier, Paul Goring, in the Rye Heritage Centre, who also sponsored this year’s events. Towards the end of the day, the tug of war competition took place. 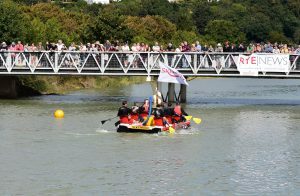 Alas not all teams were able to take part, but the winners, WS Wright, pulled a punch and kindly donated their winnings, sponsored by Rye News, to the festival to help it fund next year’s event. Councillor Rivett said: “None of this can take place without a great deal of local support. Firstly the committee who worked so tirelessly this year to bring the event about – Neil Cunliffe, treasurer and health and safety officer, Sophie Crouch for the massive job of organising the Strand, Liz PenDennis for fundraising which is no mean task, Kirsty Doherty for marketing and her beautiful design work, Ian Gibson for his tireless work preparing and cleaning up the raft race site and the Strand, Councillor Cheryl Creaser for co-ordinating and Councillor Rebekah Gilbert for admin and generally nagging us all into line! “There are a lot of costs involved in this festival with its water connection, so insurance and first aid come at a considerable price. We are grateful to GMP Accountants and Douglas Rowe Finance as our main sponsors and to Rother District Council for support with road closures and use of car parks. We also thank Bournes, Sussex Community Foundation, and other town businesses. In addition, thanks must go to the Harbour Master James Bateman, Frank and Ed Langrish for allowing us to use their land for the raft race, Councillor Ian Potter and town hall assistant Jessica Neame, Dave Kite, plus Colin Baker and team from the Rotary for piloting the safety boats and John Gurney for lending his vessel. Image Credits: Rye News Library, John Minter.